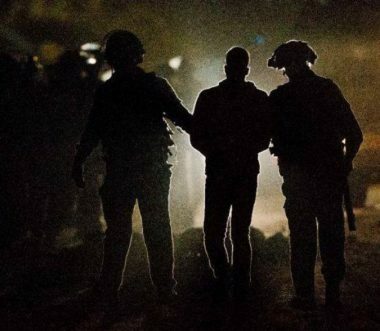 The Palestinian Prisoners’ Society (PPS) has reported that Israeli soldiers abducted, on Monday at night until morning hours Tuesday, eighteen Palestinians from their homes, after breaking into them and violently searching them, in several parts of the occupied West Bank. In a press release, the PPS said the soldiers abducted Aysam Emad Nazzal, 17, Mahmoud Riyadh Zakarna, 16, and Mandoub Bassem Kamil, 17, from their homes in Qabatia town, south of the northern West Bank city of Jenin. The PPS added that the soldiers invaded and searched many homes, in various areas of Ramallah governorate, in central West Bank, and abducted five Palestinians. The abducted Palestinians have been identified as Bassem Hasan M’eitan, 40, from Burqa town, Nihad Amin Dar al-Eid, 16, after the soldiers shot him, in addition to Waseem Mohammad Sarhan, 19, from Nabi Saleh, Ahmad Ibrahim and Khaled Omar B’eirat, from Kafr Malek town. In Tubas, in northeastern West Bank, the soldiers abducted Ahmad Fawzi Sawafta and Mwffaq Samir Daraghma. In Salfit, in central West Bank, the soldiers abducted Ameer Ammar Mer’ey, Rateb Abdul-Karim Mer’ey and Qoteiba Radhi Mer’ey. In Hebron, in southern West Bank, the soldiers invaded homes in the al-‘Arroub refugee camp, and abducted Khader Yousef Madhi, 23, after the soldiers assaulted him and his family. In occupied Jerusalem, the soldiers abducted Bassel Raed Moheisin, Ma’moun Ahmad ‘Obeid and Mohammad Abdul-Hafith ‘Atiya. Another Palestinian, identified as Mohammad Sobhi Enab, was abducted by the soldiers after they shot him near Tulkarem, in northern West Bank. Israeli soldiers abducted, on Tuesday at dawn, twelve Palestinians from their homes, in several parts of the occupied West Bank. The soldiers broke into and violently searched dozens of homes across the West Bank, interrogated many Palestinians while inspecting their ID cards, before abducting the twelve Palestinians. In Ramallah, in central West Bank, the soldiers abducted Ahmad Ibrahim, Khaled Omar Taha and Bassem M’eitan. The soldiers also closed the main gate, leading to Deir Nitham village, west of Ramallah, and prevented the Palestinians from entering or leaving it. In Qabatia town, south of Jenin in northern West Bank, the soldiers abducted Mandoub Khaled Kamil, Aysam Emad Nazzal and Mahmoud Riyadh Zakarna. In Hebron, in the southern part of the West Bank, the soldiers abducted Khader Madhi, 24, the brother of Omar Madhi, 15, who was killed by the army on February 12, 2016. In Occupied Jerusalem, the soldiers abducted Mohammad Abed Atiya, and a child identified as Ma’moun Ahmad ‘Obeid, in addition to Bassel Raed Atiya and Mohammad Abdul-Hafith Atiya. In Salfit, in northwestern West Bank, the soldiers abducted Rateb Abdul-Karim Mer’ey and Amir Ammar Aziz. Furthermore, the soldiers invaded and searched many homes in the al-Khader town, south of Bethlehem, and interrogated many Palestinians.